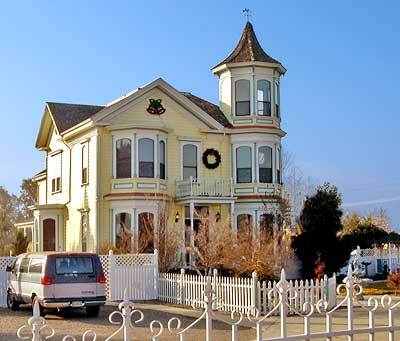 The Wood House one of the rare examples of Victorian architecture still in existence in Modesto. 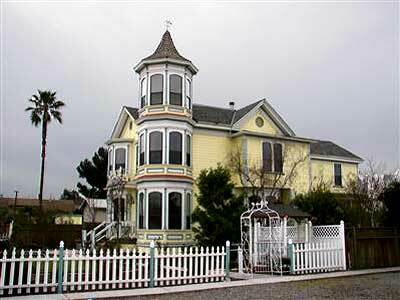 It is one of only six structures built before 1900 represented in the Historic Building Survey of Modesto. The building, although modified and given a Queen Anne configuration, maintains an Italianate character in the manner of its decoration, even in the corner tower. It is thus a good representative of this style, and a rare one as well. The first owner, Walter B. Wood, was a leading early Modesto businessman who made substantial contributions to the development of several local commercial enterprises. Excerpted from the National Register nomination dated 7 April 1988. The National Register gives the address of the Wood House as 814 12th Street. However, when we visited the 800 block of 12th Street in the summer of 2006, the block was occupied by a new, brick parking garage. After we had published the photograph of the garage, several Modesto residents advised us that the residence had not been demolished but had been moved to the corner of State Route 32 and Nebraska Avenue soon after it was listed on the National Register.